Do you have worn out tie rod or draglink ends on your Country Coach Magna or Affinity? Kaiser Brake & Alignment Inc. has designed a completely new steering linkage setup to stop wandering & premature tire wear. 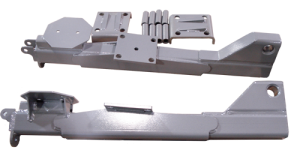 This new steering linkage package converts your coach to greaseable ends with readily parts availability if replacement is ever needed. We can add Air Ride suspension to your Safari motor home equipped with Velvetride. Over time your Velvetride can begin to sag & with parts being hard to find we have an alternative. By adding Air ride to your coach you get the added benefit of a smoother ride & you are able to level the vehicle from side to side or front to back. 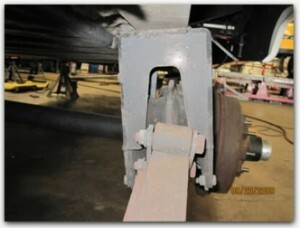 We also provide 5TH wheel & travel trailer Suspension & frame repairs. Do you have a 5th Wheel or travel trailer with a bent, twisted or Sagging frame? If so we can help. By Straightening the frame & reinforcing it we can Turn trailer frames to better the new condition. 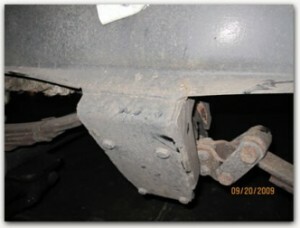 If you have a Monaco Coach Corporation (MCC) motor home built on a Roadmaster R4R or RR4R with Monaco Gold Suspension (also known as R-Way suspension) & have not had the rear trailing arms inspected please do so at you earliest convenience.MCC first discovered the problem with the trailing arms cracking or braking in February 2005 & issued NHTSA recall 05V053000. This problem does not affect coaches with Neway or Rayco suspensions. The recall involved a list of coaches built from November 30, 2001 through October 1, 2004. The initial problem was believed to be caused by transverse welds on the spacer plates located under the trailing arms making the arms crack. The recall called for the replacement of the trailing arms & mounting hardware of equal size & was re-engineered & provided by MCC. The re-engineered trailing arms have been proven to have the same problem as the original design. This is due to the original & re-engineered trailing arms not having sufficient strength to support the vehicles axle weight.Kaiser Brake & Alignment Inc. has a trailing arm replacement kit that addresses the strength issue. The new trailing arm kits are in stock & available for installation or shipping to your location. The new arms are built of 3/8” steel tubing & ½” reinforcing plates compared to the “ steel tubing & no reinforcement plates on either of the arms supplied by MCC. They are installed using 1” quality u-bolts with new high nuts & hardened washers. The complete kit adds stability & strength to support the weight required. The new arms weight in at 122lbs each compared to about 60lbs each of either one supplied by MCC. The trailing arms are powder coated in gray flake to resist rust & corrosion & come with a lifetime warranty against craftsmanship. The steel incased rubber bushing has a 1-year free replacement warranty. There is also a lifetime labor warranty when installed at Kaiser Brake & Alignment, Inc.
Kaiser Brake & Alignment, Inc. also recommends having the rear trackage set after installing the new trailing arms. By having the rear trackage set you can rest assured that you coach will not be dog tracking, causing the vehicle to wander or cause premature tire wear.